Cubs All-Star Bryan LaHair was a surprise pick from the last place team. 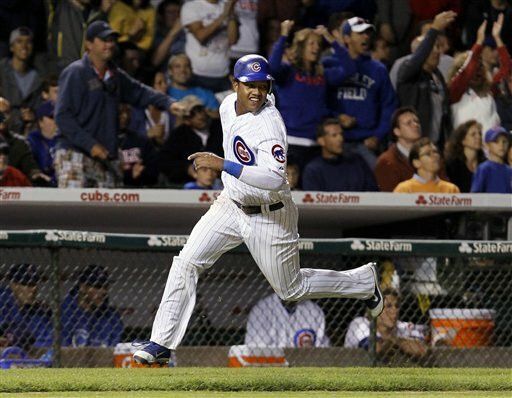 Cubs shortstop Starlin Castro makes his second appearance on the All-Star team. Sox slugger Adam Dunn returns to form in 2012, and is rewarded with a spot on the All-Star team. As baseball prepares for its annual All-Star game, five Chicago players will be making the trip to Kansas City. Some of the selections were no-brainers — but one was a surprise. Since Major League Baseball made decreed that each team will have at least one representative, the surprise was that the Cubs, a last place team, received two selections: shortstop Starlin Castro and first baseman/outfielder Bryan LaHair. LaHair was voted in by the players — but his selection was totally unexpected. He started off the season with great offensive numbers playing first base. However, since first baseman Anthony Rizzo ascended from the minors, LaHair has been moved to right field. Now he’s platooned at that position after his recent struggles at the plate against left-handers. People may raise an eyebrow about LaHair going to Kansas City, but his story is very compelling: He finally started on an Opening Day roster at age 29, after toiling in the minors. Cubs Manager Dale Sveum understood the moment’s significance, and called a meeting before Sunday’s game to announce the team’s All-Stars. “It’s a special time as a manager, to be able to tell a kid he made the All-Star team after he spent all that time in the minors,” said Sveum. LaHair addressed the media with a look of happy bewilderment. “It’s another dream come true,” he said. LaHair’s All-Star companion, Starlin Castro, will make his second consecutive appearance at age 22. He was the one expected to make the National League All-Star team, but was still glad, like LaHair, that his peers voted for him. 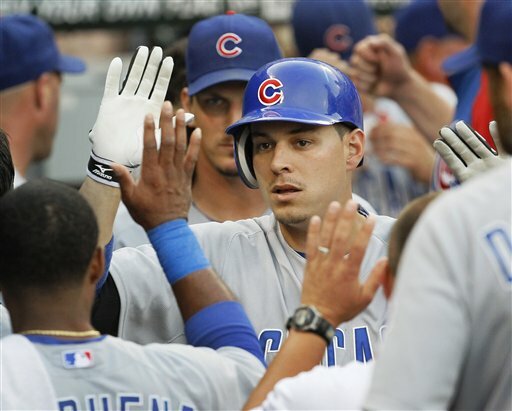 In 2011 the young Cub led the NL the league with 207 hits (the youngest player to ever accomplish that feat). He continues to have good numbers at the plate this year, but what makes Cubs coaching staff proud is his defense. Coach Pat Listach and Sveum both worked hard tutoring their star shortstop. It’s clearly paying off. There is one more Cubs All-Star representative: first base coach Dave McKay. He was a long time member of Tony LaRussa’s coaching staff and will join the retired St. Louis Cardinal Manager in the NL dug-out. It was expected that the American League Central First Place White Sox would have more than one player represented on the All-Star team. The choices that were made are understandable — but interesting nonetheless. Paul Konerko is so good he could probably be named to the All-Star team just about every year. He has been in the top ten of several batting categories in the AL this season. What was intriguing, though, was the choice of Adam Dunn to join Konerko on the roster. Just a year ago, Dunn was unable to produce the big home run numbers he was signed to do. This year, with a clean slate, the Sox designated hitter has been one of the team’s best sluggers, consistently hitting the ball out of the park. From the Sox pitching staff, starter-then closer-then starter Chris Sale was also named to the American League team. At 23 years of age and firmly established in the Sox starting rotation, he has been brilliant. He is one of the best pitchers in ERA and wins. Manager Robin Ventura adjusted his rotation, so the lefty could pitch in the game and maybe have the ultimate honor: starter for Tuesday night’s game. The fans vote online for the final spot and Sox starter Jake Peavy is one of five pitchers on that ballot. Like Dunn, 2011 was a nightmare season for the former Cy Young winner. But 2012 has been very different. He is among the leaders in ERA, innings pitched and complete games. Had Peavy gotten some run support, his win total may have put the right-hander on the team outright. Fans have until 3 p.m. Thursday to stuff the ballot box. Of course, there is one All-Star snub that even Texas Manager Ron Washington felt bad about: Sox catcher AJ Pierzynski. Washington will manage the AL All-Stars and recognized the offensive numbers the Sox catcher is putting up; still, he had to take a player from Minnesota and gave that spot to Twins catcher Joe Mauer. A recent poll taken by MLB players had the Sox colorful catcher voted the most hated player in baseball, so there wasn&apos;t a chance his peers would select him for the All-Star team. It just wouldn’t be right if AJ wasn’t involved in some controversy. For the rest of the players, the four days off present a welcome time to rest any aches, pains or mental fatigue. For a few of the Chicago All-Stars the game will be a time for Cubs star Bryan LaHair to celebrate what some thought may never happen and a night for Adam Dunn of the White Sox to hear the roar of cheers after a year of boos.